This article explains the procedure for converting from LP gas or "bottled gas" to natural gas or "piped in gas" at a building. Watch out: Most manufacturers require that installation and fuel conversions shall be performed by a trained and qualified service technician. The technician should be sure to correctly identify the model number of your gas appliance so that s/he can follow the correct details of the manufacturer's instructions. GAS COOKTOP INSTALLATION into a countertop - separate article series describes piping connections, electrical connections, countertop preparation, countertop opening & clearances, testing for gas leaks, securing the cooktop to the countertop & final inspection & tests. The gas regulator at or in the appliance must be switched to the appropriate fuel: LPG or natural gas. Most appliance gas regulators can be converted in the field. For example in a Bosch unit I am working on the instructions have you remove a cap and invert a component inside the regulator, depending on which fuel you are using. The gas metering orifices or jets are changed at each burner in the appliance. Natural gas and LP gas do not use the same orifice sizes to achieve the appliance's designed BTU rate at the burner(s). Just changing pressure won't do it and is dangerous. The manufacturer may refer to these parts as "spuds" or "orifices" or "metering jets". The air mix at the gas controls at the appliance is changed to the appropriate rate for the fuel. 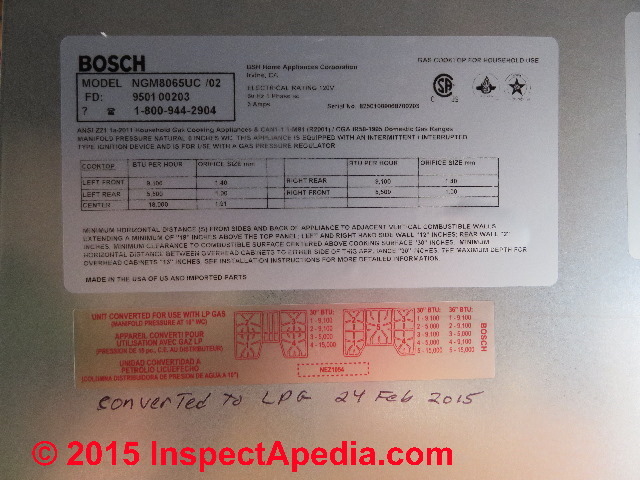 For example in a Bosch gas range top that is delivered ready for natural gas, to convert to LP gas the instructions require the installer to rotate an adjustment screw (gently to a closed position in the case of this appliance) found at each of the individual burner controls on the appliance. Some appliances such as a gas range that includes both a cook top and an oven will also require additional changes and adjustments at the oven. The gas appliance conversion kit manufacturer will provide a sticker indicating that the appliance has been converted - in this case from natural gas (as shipped from the factory) to ready for use with LP gas (propane). 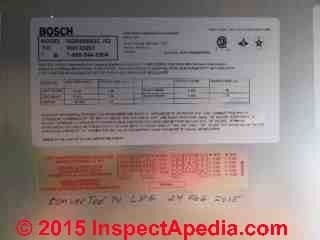 Be sure that that identifying sticker is affixed next to the appliance model and serial number data tag. This conversion kit shall be installed by a qualified service agency in accordance with the manufacturer’s instructions and all applicable codes and requirements of the authority having jurisdiction. If the information in these instructions is not followed exactly, a fire, explosion, or production of carbon monoxide may result, causing property damage, personal injury, or loss of life. at GAS PIPING, VALVES, CONTROLS. Tools listed by the manufacturer for converting between natural gas and LP gas or propane and for installing a gas cooktop or range will typically include a small-bladed screwdriver, a nut driver, and wrenches. It's a rare installation job that goes like clockwork without encountering a surprise, as we will illustrate. For example you may need a hammer and chisel if minor adjustments to wood obstructions intrude into the appliance opening, and you will certainly need both thread sealant designed for gas piping installation and a gas leak detector solution. Above left are the manufacturer's instructions, slip joint pliers, a marker, a metric hex key set (more on this later), a small bladed screwdriver that fits the burner control knob air adjustment screws (more on this later), and a magnifying glass that let blind old guys read the stampings on the spuds or gas orifices. You'll need a nut driver sized to match the spuds or orifices to be removed or installed along with a gas leak detector and thread sealant formulated for use on gas piping. As the manufacturers all insist that gas appliances should be installed only by a qualified technician (or by a licensed installer as is required by building regulations in some jurisdictions) we know you'll have all of these tools and supplies, but it's nice to have them at hand. For example, the nut driver for modern gas appliance spuds may be a size that you didn't have, or you may have nut drivers only in inch-dimensions and you may need to buy one in metric dimensions to avoid damaging the brass orifice spud. In an excerpt just below we illustrate removing the cap from the gas regulator for a Bosch gas cooktop in the NGM80 series. At below right the cap has been removed by unscrewing it from the regulator body. Close-up photos follow. Typically the conversion between fuels requires simply the rotation, inversion, or adjustment of parts already present on the gas appliance. See GAS APPLIANCE CONVERT REGULATOR NATURAL GAS-to-LP for details. from gas leaks. See CONVERT the GAS ORIFICES for complete details. A brief excerpt from that article is just below. For most gas cooktops a threaded brass orifice or "spud" is used to meter gas at the proper flow rate at each burner. Gas flow rate, a combination of supply pressure and orifice diameter, determines the quantity of gas available at the individual burner and thus sets its BTU output rate or range. The orifice diameter of these tiny little parts is different between natural gas and propane or LP gas. This means that you will need to change the orifice fittings to match the fuel you intend to use. When converting an appliance from using a lower pressure natural gas fuel supply to a higher pressure LP or propane gas fuel supply, the new orifices will be smaller in diameter to accommodate the higher pressure of the fuel supply without releasing too much fuel too quickly. Your appliance technician will have to select the proper orifices, remove existing orifices, and install the new ones in the right location following the conversion kit instructions from your appliance's manufacturer. Some gas cook tops convert between Natural and LP gas at the Burners by turning or adjusting an air shutter (sketch at below left) while others require that you turn a screw adjustment inside or next to the burner control knob. Here is an example of a convertible gas range burner top. The valve hood (at left in the photo) is adjusted to an open or closed position depending on use with natural gas or LP gas. Find and obtain the precise instructions from the manufacturer of your own appliance brand, model, and serial number in order to be safe. Next we need to adjust the individual gas burner control air mix at the burner control knobs. Turn the burner control knobs to the "OFF" position before proceeding. At above left we see the control knobs in place on the Bosch cooktop and at above right they've been removed and set aside. For Bosch gas cooktops there is a small air adjustment screw that needs to be set at each control knob position. Depending on the cooktop model the screw may be found inside the cooktop adjacent to a solid-stem control knob shaft or the screw may be (almost impossible to see) down in the center of a hollow-stem control knob shaft itself (shown in photos below). A rubber gasket intended to keep crud out of the center of the control knob shaft will make it impossible to see the adjustment screw - you'll locate it by feeling gently inside the control knob shaft with your long small bladed screwdriver. You'll find that the screwdriver blade will insert about 1 1/2" into the hollow control knob stem, passing the rubber gasket, and finding the adjustment screw. Gently turn the screwdriver to find the slot in the adjustment screw - it's a slot not a phillips-headed screw. Which way to turn the adjustment screw: the details of this air adjustment will vary by manufacturer. For the Bosch cooktop we are installing here the company says that to convert from natural gas to LPG (propane) you will need to turn the screw less than one full turn clockwise to a "closed" position. For our Bosch cooktop Bosch says you'll turn the screw just about 70 degrees clockwise (less than 1/4 of a turn) until the screw bottoms out. Your cooktop may have different specifications. Watch out: Bosch warns that you must not use excessive force when turning the air adjustment screw or you can damage the assembly. After setting all of the burner control air screws for the cooktop, replace the control knob and you've finished this step. The gas burner orifices or spuds have been changed out to insert orifices for the fuel being used (LPG in our case). The gas burner air adjustment screw (or air adjustment shutter on some models) has been adjusted for the fuel being used (LPG in our case). Gas Burner Flame Color Checks: How do we know if the gas regulator, orifices, and air supply are adjusted correctly? Gas Odors: A gas leak can be indicated by gas odor such as in the utility area near appliances or elsewhere in the building. From a safe location, call your gas company's emergency line and/or your fire department. The text provided here is a working draft and may be incomplete or inaccurate. You should have your plumber test, repair, or replace any suspect gas controls or piping promptly. Replacement of a control itself should not involve significant expense. This repair should not be deferred. You should be sure that building occupants know if this or other unsafe conditions are present. The photo above shows the gas flame after a successful installation of our Bosch gas cooktop converted to burn propane. There is just a trace of yellow in the flame tips. Any of these indicate a possible malfunction of this equipment. Watch out: Any of these LP gas , propane, or natural gas burner conditions is potentially very dangerous and needs prompt attention. You should have your utility company or service person check the appliance immediately. Here is an example of a convertible gas range pressure regulator. The oven burner hood is adjusted to an open (Natural Gas) or closed (Propane) position depending on the fuel. Additional steps may be needed for your appliance, such as adjusting air mixture at the burner for the proper flame. Watch out: failing to properly install, adjust, and vent a gas fired appliance can result in dangerous, even fatal carbon monoxide poisoning, gas leaks, a fire, or other dangerous conditions. These two fuels are similar in that both are used to provide energy to home heating systems and other appliances but they have some different properties of weight, method of distribution, and chemistry. Most gas appliances are delivered already set up to use either natural gas or LP gas but not both. Most gas appliances can be converted from one fuel to the other - what is involved may be simply changing gas metering orifices in the equipment (for example at the burners on a stove) or it may also be necessary to change or adjust a gas regulator located inside the appliance. Do not hook up an LP gas-ready appliance to a natural gas supply nor can you connect a natural-gas ready appliance to an LP gas supply without reviewing and acting on the manufacturer's instructions for converting the appliance from one fuel to the other. Important Safety Warning: be sure that all gas-fired appliances in your building have been properly set up for the correct type of gas to be consumed. Watch out: General safety warning: improper installation and even improper inspection and testing methods involving natural or "LP" gas can involve dangerous conditions and risk fire or explosion. If you smell gas you should leave the building immediately and should do so without doing anything that could create a spark such as operating a light switch or telephone. Do not connect an appliance set up for propane to a natural gas supply, and do not connect an appliance set up for burning natural gas to a propane gas supply without first making the required gas pressure and/or gas metering orifice adjustments. Making either of this mistakes can lead to gas leaks, fire, explosion, or potentially fatal carbon monoxide poisoning. Virtually every modern gas fired appliance installation manual contains instructions for setting up the appliance to burn the proper fuel: LP gas (liquid propane from a tank installed at the property) or natural gas (piped in gas provided from a local gas utility company). The pressure provided by natural gas is different from propane - adjustments will be needed at every gas fired appliance in the home. Usually this means either an adjustment made at each gas burner at a metering device or in some cases a part actually has to be changed (an orifice through which the gas passes). 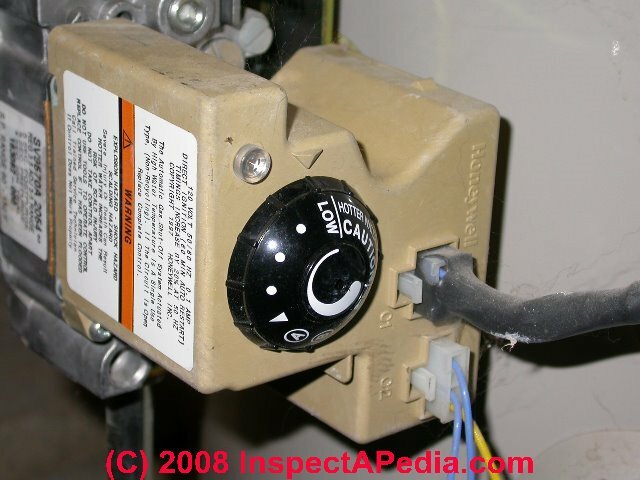 On some appliances there may be a local gas regulator that also needs to be adjusted. Where a gas burner metering device needs to be set properly for Natural Gas pressure or for LP gas pressure, the adjustment may be as simple as using a screwdriver or tool to turn the orifice from one position to another at each burner, or a part may need to be actually swapped out or exchanged. Appliance installation instructions will include sketches of where these parts are found as well as directions for how to set the metering device or regulator for the proper fuel. For LP Gas the pressure is regulated at the LP gas tank by a primary regulator and further pressure is matched to the requirements of the individual appliance by a regulator located at or in some cases inside the appliance such as a gas cooktop or gas clothes dryer or water heater. At some buildings, particularly with long gas line runs there may also be an intermediate or building gas pressure regulator, particularly if the LP tank is distant from the building. And for some appliances such as gas ranges and ovens, additional gas flow regulation is performed by a special metering orifice right at the gas burner. We illustrate these gas regulators and orifices as well as fuel conversion between LP gas and natural gas in this article. On many gas fired appliances the only adjustment that is required is to change or turn/adjust the gas metering orifice at the appliance burner. Watch out: Do not hook up an LP gas-ready appliance to a natural gas supply. Do not connect a natural-gas ready appliance to an LP gas supply. First you must read and act on the manufacturer's instructions for converting the appliance from one fuel to the other. It is virtually always the case that some equipment adjustments and changes are necessary to switch between natural gas and propane gas. Testing for gas leaks after hookup is complete is another important safety step that should not be skipped. The proper setup of gas burning appliances is very important since failure to set the appliance for the proper gas type can result in very dangerous, even fatal carbon monoxide production from improper combustion. If your natural gas supplying company or plumber who is doing the hookup has not already offered to do so, ask them to go through the home identifying every gas-burning appliance, determine exactly what changes are needed, and make them before the appliances are again turned on with the new fuel supply. Follow the appliance setup and gas fuel type adjustment instructions in the appliance installation manual provided by the manufacturer. If you cannot find the installation manual for your gas fired water heater, stove, furnace, boiler, or other gas fired appliance, make a note of the appliance name, model number, and serial number, and contact the manufacturer directly for these critical instructions. The actual conversion from LP to or from Natural gas at the appliance itself is usually quite easy, but doing it properly is essential for safety. and GAS REGULATORS for LP TANKS. These two gas fuels are similar in that both are used to provide energy to home heating systems and other appliances but they have some different properties of operating gas pressure, weight, method of distribution, and chemistry. Most gas appliances are delivered already set up to use either natural gas or LP gas but not both. 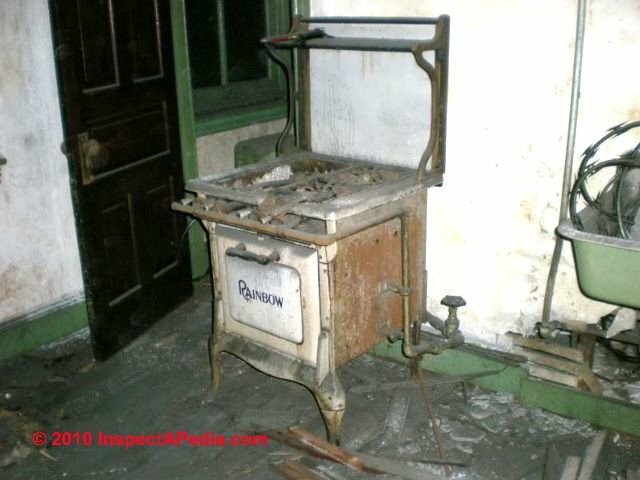 However some older gas appliances such as the gas stove shown in our photo (above/left) may not be convertible between gas fuels. Watch out: if the fuel at your building is not the fuel for which the gas fired appliance is set-up, the appliance must be converted to match the fuel you will be using. That conversion involves several steps and is not simply a pressure adjustment. Actual NG or LPG gas pressures vary: [Note: the exact pressure you see in the building at an appliance may vary from these numbers depending on the gas distribution piping system size, diameter, number of appliances served, number of appliances operating, regulator adjustment, and other factors. The following additional examples show again where adjustments are required on a typical gas stove to convert between LP gas and Natural Gas. These examples are for a Glenwood Sunray gas range produced by the Glenwood Range Company. These adjustments should be made by a trained appliance installer or service technician. 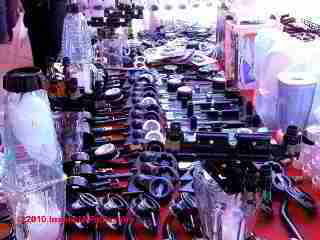 Our photo (left) shows gas appliance parts and controls for sale at an open air market held on Tuesdays in San Miguel de Allende, Mexico. But as we warn below, installing or modifying parts on a gas appliance can be dangerous if you don't know what you are doing. Watch out: these gas fuel type conversion examples are intended only for the purpose of general understanding of the type of changes that may be needed at a gas fired appliance. Be sure to consult with the manufacturer or the installation and service manual to obtain and follow the exact gas fuel conversion steps for your particular gas appliance. Otherwise your gas appliance is likely to be unsafe. To obtain the proper installation and service manual for your gas appliance you will need the product name, model number, code numbers/letters, serial number, and the date of installation or manufacture. Watch out: If your gas cooktop came from the factory set-up for natural gas and your fuel source is propane (or vice versa) you should complete all of the gas conversion steps before proceeding to install the cooktop into the countertop. See GAS APPLIANCE CONVERT LP-to-NATURAL GAS if you need to make this changeover. Reader Question: Can I use natural gas in a LPG oven,after boosting its pressure 2000 pa to 2800 pa and without changing its nozzles? Can I use natural gas in a LPG oven,after boosting its pressure 2000 pa to 2800 pa and without changing its nozzles? Can I use natural gas in a LPG oven,after boosting its pressure up to 2800 pa and without changing its nozzles? Watch out: changing the gas supply pressure to a figure outside the standards specified by the manufacturer simply to try to switch between LPG and natural gas won't work and is dangerous. The gas metering orifices or jets are changed at each burner in the appliance. Natural gas and LP gas do not use the same orifice sizes to achieve the appliance's designed BTU rate at the burner(s). Just changing pressure won't do it and is dangerous. In addition the manufacturers typically require that the conversion of a gas fueled appliance between LPG and Natural gas should be performed by a trained service technician who will also perform certain pressure and leak tests that are essential to avoid a fire or explosion. And depending on where you live, such as in the U.S. in Massachusetts, the conversion of an appliance between LPG and Natural Gas is required by law to be performed by a trained and qualified service technician. Reader Question: what can go wrong if wrong gas size orifices are installed? When converting a 90,000BTU furnace from Natural Gas to LP Gas (Propane), what can go wrong if the contractor installs the wrong size gas orifices? For example, if the proper LP Gas orifice is supposed to be size 1.15 (.0453 diam.) ..what can happen if he installed size 54 (.0550 diam.)? Specifically, can it cause excessive soot and eventually plug the heat exchanger? This question was posted originally at HEATING SYSTEMS and also at the link cited just below. See GAS PRESSURES LP vs NATURAL GAS where in the FAQs we addressed this when that post was first seen. I have a kiln and furnace in a foundry. I have used LP gas at 15 lbs pressure through an initial 1/4 inch tubing into a 3/4 inch tube that divides into two 3/4 inch open pipes that serve as dual burners, when squirrel cage blowers are incorporated. These allow for the melting of bronze at 2200 degrees F.
I have converted to natural gas. With the same set-up and "standard pressure" (whatever that is?) adequate volume of gas and necessary btu is not being obtained. What should the pressure be to obtain comparable cubic feet of natural gas - compared to propane? I now can obtain the necessary btu when using a small hand torch and natural gas with atmospheric air. But the volume is inadequate for the furnace/kiln combination. Your help shall be appreciated. Watch out: You should SHUT OFF YOUR EQUIPMENT IMMEDIATELY if you have not already done so. It is unsafe. Ben, thanks for the interesting & important LP-NG conversion question. We know that it's critical for both function and safety to get the pressures, orifices and metering devices, and equipment air mixtures correct when converting between LP gas and natural gas. Natural gas is a much lower pressure gas than propane and converting the appliance to one or the other gases requires that the differing pressure is compensated for. In other words, connecting a natural gas appliance to a propane piping system will result in appliance malfunction and possibly danger. The reason for this is because natural gas orifices are larger than propane orifices strictly because of gas service pressure. In this case, the higher pressure gas flowing through a larger orifice will result in more gas through the burner and likely, more flame...an unnecessarily large flame. Conversely, trying to use a propane appliance with natural gas will likely result in a very small flame or no burner flame at all because of the lower pressure gas and the smaller orifice. This is the underlying purpose of an appliance conversion from propane to natural gas or from natural gas to propane. Additionally, appliances cannot be converted from electricity to propane, or vice-versa. If your equipment does not include a label indicating that it CAN be converted between fuels, you should not assume that such conversions will work and are safe. Generally a "conversion" changes both metering devices that meter the gas fuel and the air mixture adjustments as well. An improper air mixture adjustment, particularly in gas fired equipment, can produce fatal carbon monoxide gas. What Components May Need to Be Changed Out or Adjusted on a Gas Fuel Conversion Job? To convert fuels in a gas fired appliance the propane experts I cited list more parts than you may realize that may need to be changed, including (besides what I've already listed) burners, burner tubes, regulators, orifices, safety controls, combustion air supply equipment, and venting of flue gases - equipment, chimneys, power vents, etc. Should you Just Replace the Heating Equipment rather than Convert? The opinion of the propane fellows (and women) is that for some equipment that was not *designed* to be convertible between fuels, you'd be better off buying new equipment intended to work with the new fuel. But before I'd consider such a step, I'd identify the brand and model of the foundry kiln and furnace you mentioned, find the manufacturer, and give them a call to ask advice. I'd be surprised if a gas fired equipment manufacturer produced products only for one fuel. see GAS BTUH, CUBIC FEET & ENERGY and also see Brinzea (2010) in our citations. See pp. 5-6 describing converting a Harper-Wyman gas regulator between LP gas and Natural gas, in these instructions for the Thermador Professional Pro dual-fuel gas ranges. These gas regulator conversion instructions pertain to other appliances as well. The normal burning velocities of propane'air mixtu res were calculated from the expansion coefficients and the cubic law constants of flame propagation in the early stage of closed vessel explosions, using the adiabatic compr ession model. The experiments were made in a spherical vessel with central ignition in various initial conditions: pressure within 0.3÷1.3 bar, temperature within 298÷423 K, propane concentration within 2.80÷6.22 vol.%. The expansion coefficients were computed for the adiabatic isobar ic combustion, assuming equilibrium is reached in the flame front. Notice: as of the retrieval date, and regarding authority, the "Propane 101" website does not name authors, provides no contact information, no address. Continue reading at GAS COOKTOP INSTALLATION or select a topic from closely-related articles below, or see our complete INDEX to RELATED ARTICLES below. GAS APPLIANCE CONVERT LP-to-NATURAL GAS at InspectApedia.com - online encyclopedia of building & environmental inspection, testing, diagnosis, repair, & problem prevention advice. 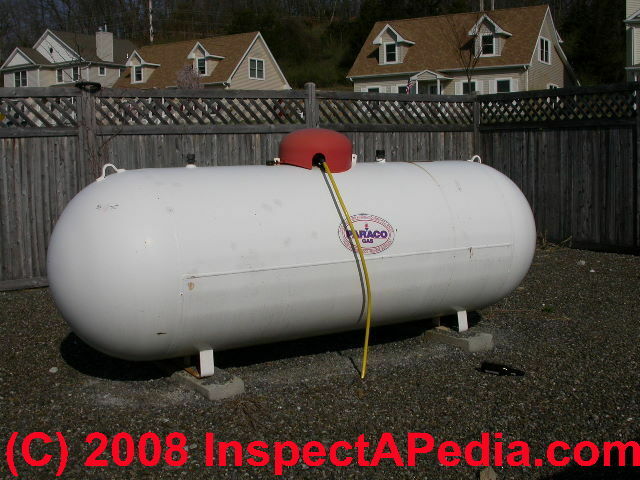 Questions & answers or comments about gas fuel conversions: LP or "bottled gas" to piped-in natural gas service. At geocities.com/rainforest/6847/report1.html is an interesting and detailed though not “neutral” report on the components and contaminants in the combustion of natural gas. You’ll see a long long list of emissions products, but look again – most of the contaminant levels listed are in the picograms. Tussing, Arlon R., & Bob Tippee. The Natural Gas Industry: Evolution, Structure, and Economics. 2nd ed. Tulsa, OK: PennWell Publishing, 1995. Thanks to reader JR for discussing LP and natural gas operating pressures and leak detection safety, October 2010. Glenwood Range Company, Customer Service, 435 Park Ave., Delaware OH 43105, 614-363-1381, Glenwood-Sunray Service Center: 215-682-4211.